Dazzle the crowd with a modern three-stone diamond ring. We have an array of diamond cuts, colors and sizes available at prices to suit any budget. Three stone rings are exactly that – a ring with three precious stones. 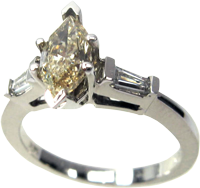 CaratsDirect2U specializes in diamond rings and our inventory includes different types of 3-stone rings. It is worth noting that 3-stone rings are an excellent choice for engagement rings too. All of our three stone rings are matched by a master jeweler. And the diamond themselves can, of course, be set in virtually any precious metal. For example, 14K white gold or 18K yellow gold or platinum. Our inventory includes round diamond three stone rings as well as the harder to match three stone rings – such as oval diamond rings and radiant cut diamond rings. It should be noted that all of our products are affordable and are offered directly to you at much lower than retail prices. We also provide classic and one-of-a-kind items suitable for every budget. So be sure to check out our collection of 3-stone diamond rings and do not hesitate to contact us with any diamond or diamond-jewelry related questions you may have.